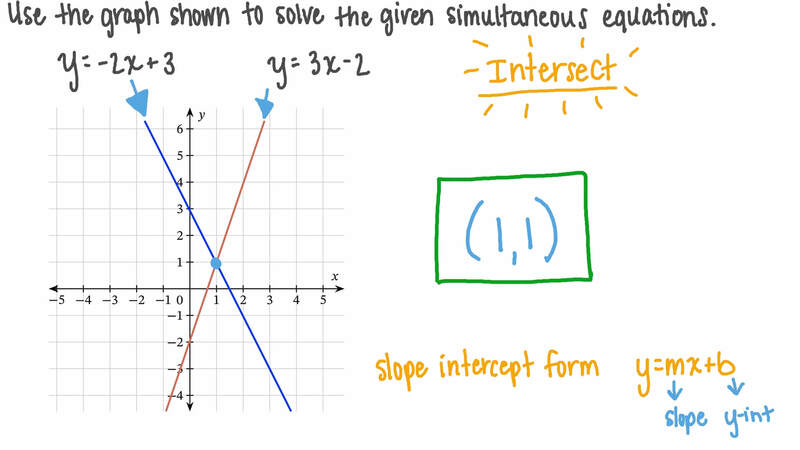 In this lesson, we will learn how to solve a system of two linear equations by considering their graphs and identifying the point of intersection. Find the solution set of the two equations represented by the 𝐿 1 and 𝐿 2 . Which of the following sets of simultaneous equations could be solved using the given graph? By plotting the graphs of 𝑦 = − 2 𝑥 + 1 and 𝑦 = 𝑥 + 4 , find the point that satisfies both equations simultaneously. Plot the graphs of the simultaneous equations and then solve the system. AThere are no solutions as both equations represent parallel lines. CThere are infinitely many solutions as both equations represent the same line. 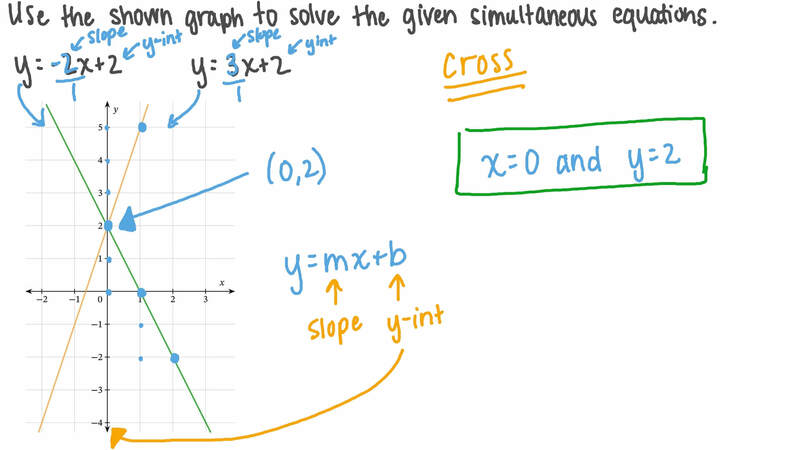 Determine whether the simultaneous equations plotted in the given graph have a solution. AThey do not have a solution. DThey have an infinite number of solutions. Plot the graphs of the equations and then solve the system. Using the given graph, determine whether there is a point whose coordinates satisfy the equations of both lines simultaneously. If yes, find its coordinates. AThe two lines are parallel, so there is no such point. BThe intersection point is ( 0 , − 5 ) . CThe intersection point is ( 1 , − 2 ) . DThe intersection point is ( 0 , − 2 ) . EThe intersection point is ( 3 , − 5 ) . By plotting the graphs of 𝑦 = 𝑥 − 1 and 𝑦 = 5 𝑥 + 7 , find the point that satisfies both equations simultaneously. The given graph shows the lines 𝑦 = 2 𝑥 − 1 and 𝑦 = − 4 𝑥 − 7 . Determine the point whose coordinates satisfy both equations simultaneously. By plotting the graphs of 3 𝑥 + 2 𝑦 = 1 0 and 6 𝑥 + 4 𝑦 = 3 0 , determine the pair of 𝑥 - and 𝑦 -coordinates that satisfies both equations simultaneously. AThe two lines are parallel, so there is no solution. BThe point coordinates that satisfy both equations are (5, 5). CThe point coordinates that satisfy both equations are (0, 5). DThe two lines are coincident, so there is an infinite number of solutions. EThe point coordinates that satisfy both equations are (5, 0). BThere are infinitely many solutions as both equations represent the same line. DThere are no solutions as both equations represent parallel lines. 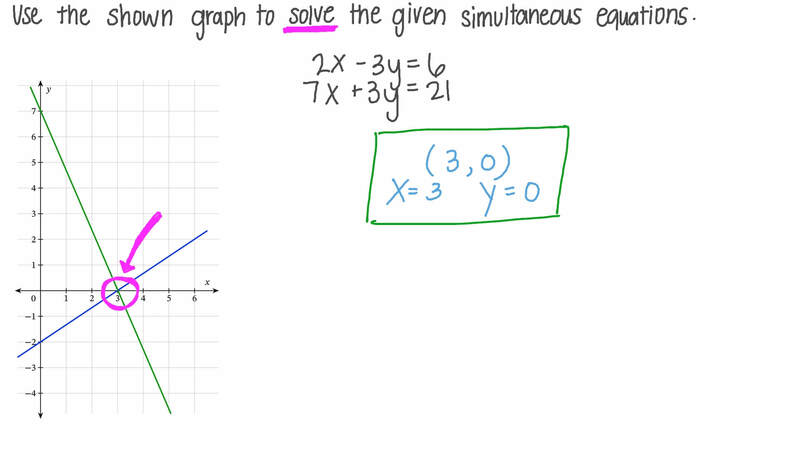 Do the simultaneous equations plotted in the given graph have a solution? If yes, find it. By graphing the functions 𝑓 ( 𝑥 ) = 3 𝑥 − 2 and 𝑔 ( 𝑥 ) = 4 − 𝑥 , state the point at which they intersect. The given graph shows the lines 𝑦 = 𝑥 + 1 and 𝑦 = − 𝑥 + 3 . Determine the point whose coordinates satisfy both equations simultaneously. The given graph shows the lines 𝑦 = 3 𝑥 − 1 and 𝑦 = 4 𝑥 − 7 . Determine the point whose coordinates are solutions to both equations simultaneously. Do the simultaneous equations 𝑦 = 1 3 𝑥 + 4 3 and 𝑦 = − 1 2 𝑥 + 1 1 2 plotted in the given graph have a solution? If yes, find it.